Lawmakers Vote To Make California A 'Sanctuary State' : The Two-Way The legislation would prohibit California law enforcement officers from communicating with federal immigration enforcement agencies, with some exceptions. Delilah Gutierrez holds a sign during a protest against President Trump's efforts to crack down on immigration in San Francisco earlier this year. The California Values Act would forbid state and local law enforcement agencies from providing information to or acting as the deputies for federal immigration authorities. The bill also prohibits police and sheriff officers from inquiring about a person's immigration status. The bill was introduced just before President Trump's inauguration and met opposition from some in California law enforcement, including many local sheriffs who lobbied California Gov. Jerry Brown to intervene, as KQED's Scott Shafer reported. The bill now heads to the governor's desk where he is expected to sign it. Democrats used supermajorities in the state Capitol to pass the bill they saw as an expression of their support for California's estimated 2.3 million undocumented immigrants. 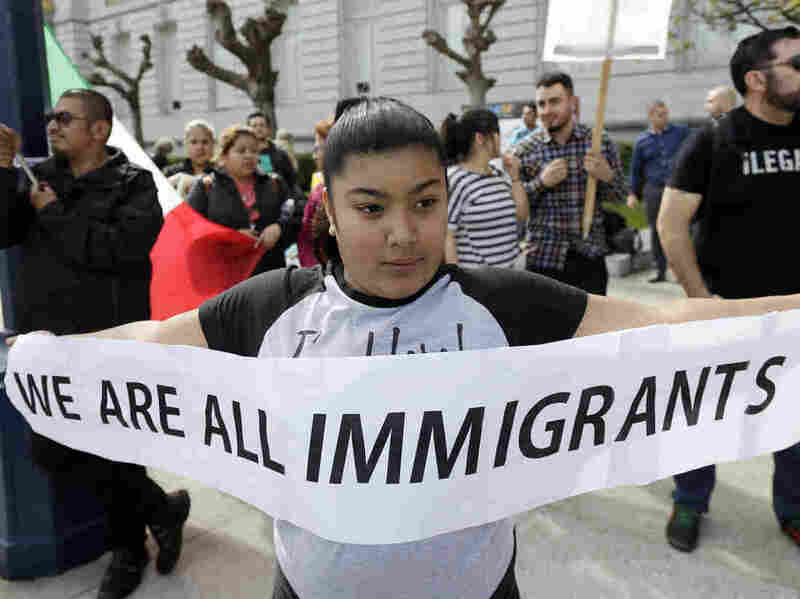 "This bill here today helps some of us to believe that California is a safe place for immigrants, that we are a Golden State," said Democratic Assemblyman Joaquin Arambula, the grandson of immigrants who came to California illegally. While the revisions earlier this week disheartened some immigrant advocates, the compromise did award them additional victories. For instance, immigrant inmates would now be allowed to earn credits to reduce their sentences if they complete educational or rehabilitative programming while incarcerated. "A lot of people talk about building a wall. This bill builds a wall between the federal government and our local partners and makes our communities less safe," said James Gallagher, a Republican assemblyman. The exceptions created in the compromise earlier in the week were also not enough to win support from the California State Sheriffs' Association. "Our overarching concern remains that limiting local law enforcement's ability to communicate and cooperate with federal law enforcement officers endangers public safety," the group said in a statement. The bill's passage comes less than a day after a federal judge in Chicago blocked the Trump administration's attempt to withhold grant money from so-called sanctuary cities. The California Values Act would not necessarily make California the country's first "sanctuary state." Oregon passed a similar, though less protective, measure 30 years ago.